Be it that you’re newly married, or you have a newborn, how much angbao to give differs from year to year. Here’s an updated angbao rate list for you to not seem like the “scroogy” aunt/uncle this Chinese New Year. Remember to NEVER give angbaos in denominations of $4, as it is inauspicious. > $80, higher, especially if you stayed with your grandparents when you were younger. $50-$150, you should give your grandchildren more or less the same amount you would give your children. > $80, to show gratitude for your upbringing. $20-$100, this amount may vary with different families. I’ve always gotten $20 from my parents, while my peers get between $30-$80. As your child gets older, how much angbao they get may increase. As for your child’s spouse, it’s safe to give $50 as that is what your in-laws are also likely to give. $10-$50, depending on how close you are. It is also not necessary to give to an older sibling, as it is assumed they are already adults, capable or supporting themselves. $10-$28, and only to cousins younger than you, as similar to the sibling rule, older cousins are able to support themselves. $8-$18, depending on how close you are. $8, as a small token to wish them a Happy New Year. A good rule of thumb would be to give them the amount they gave your children. $8-$10, just for face sake. $2-$38, how much angbao would depend on how reliant you are on their services. And finally, Happy Chinese New Year from the Diaper Cakes SG team! Food has become an incredibly popular focus for kid bloggers over the past year. More and more young people are blogging about the food they like to eat, recipes they’ve created and yummy treats they’ve baked. With three meals a day, a food blogger never runs out of ideas for blog posts. The down side is that it can take more work to be a food blogger – you have to decide on a recipe, gather your ingredients and then actually do some cooking whilst taking plenty of pictures before you write the post. Or more realistically, you have to snap out of your food coma so you can get to writing and reviewing! But the up side of that is that you are learning a skill you can use your whole life (we mean cooking as well as blogging), plus you’ll have something nice to eat at the end of it. 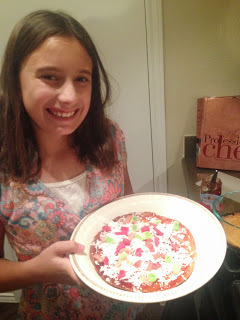 We loved Grace’s recipe for Candy Pizza which she shared with us recently. This talented 4th grader is crazy about cooking. Seven-year-old Daniel has ambitions to be a chef, and on the evidence of this blog we think he will indeed be a brilliant one. Daniel also has a non-cooking blog called, appropriately enough Outside of the Kitchen. A beautiful looking blog from 12 year old Myfanwy, who says “my favourite ingredient is love and I put it into all my bakes”. She’s already won two national competitions – definitely a baking star on the rise. Love can make some pretty macaroons! Lucas lives in Guatemala and cooks all sorts of exciting recipes. Great pictures mean that you can cook along with Lucas too. Mally’s recipes sound so delicious we were practically drooling at the screen. Luca’s been quiet on the blogging front lately, but we hope he comes back soon. We love his mission to prove that kids can be gourmets too. Not so much a recipe blog but lots of good food info here as Suki reviews London’s best restaurants. If you’re looking for recommendations for where to eat with your family in central London, Suki’s got the lowdown. Lucy’s the longest standing young food blogger we’ve found – she set up this blog when she was 13 and is now 18. It just shows you that there are always more delicious recipes to cook. There are some seriously good cakes and pies in this blog. Seventeen-year-old Scarlett is into baking, knitting and lots of craftiness – the perfect recipe for a beautiful blog. Now, this isn’t strictly speaking a food blog (actually it’s a fascinating record of life by two sisters aged 7 and 10 who’ve moved to Africa), but we had to include it because it features the most original recipe we’ve seen. – Cooking With Cow Poo! Would you try it? So they can’t all be junior masterchefs on their own TV show, but they can definitely write, review and produce recipes for a start! And maybe we have our own kid food bloggers in Singapore too…. Leave a comment if there’s an aspiring kid food blogger, or anyone who’s already one! Personalized with Baby Emily’s name and wrapped in 46cm white and purple premium gift box. Thank you Priscilla Sim for your support! Mommy’s Prince Charming! 2-Tier Mickey Mouse Diaper Cake For Baby Ryden! Because Happiness is simply grateful for all that we have..
Personalized with pretty ribbon and Baby Ryden’s name and wrapped in 46cm white and purple premium gift box. Thank you Jane Lim for your support! Dear baby Eden, be ready to get all the love and pampering from your lucky parents. Customized with Baby Eden’s name and packed in our premium gift box! Thank you Shire Li for your support! Mummies and Daddies! Have you always wondered how your lives would be made much easier if certain products actually exist? Well, you might just find your answer here in our compilation of baby shower gifts that are absolute genius! Like why didn’t anyone think of these earlier??! Always wondering what your little one is doing inside? Now you can skip the long queue at the gynae’s and see for yourself with this cool little gadget! This baby cry analyzer is a life-saver! Especially during the endless nights of baby crying, when us first time parents are trying to figure out how in the world we can stop the fussing. With the analyzer, we can know instantly if the baby is crying because he is hungry, needs a diaper change or is just plain tired. Available on Amazon. These adorable handmade extenders will increase your baby’s onesies by one size, so Ta-Dah! More time to plan for the dressing up and mall shopping! Having a baby does not mean you gotta give up your exercise regime or healthy lifestyle! Check out this cool foldable bicycle with an adapter fit for a baby stroller. Now you can work out with baby in tow! Perfect for feeding your little one during the fun weaning stages, these Squooshi reusable food pouches are easy to fill, easier to clean and comes in adorable designs that are sure to attract your mini-me! Time to whip out some mashed greens for my fussy eaters! Diaper Cakes are cute & memorable baby gifts suitable for baby showers and full month celebrations.